This painting was presented in 1908 at the first in the series of «Golden Fleece Salon» exhibitions, organized by the eponymous magazine, a foremost Russian magazine of the time, proclaiming the newest principles of art. This exciting and original exhibition of Russian and French new wave artists became a turning point in the history of twentieth century Russian culture, granting the development of avant garde art in Russia a powerful impetus. The exhibition consisted of more than two hundred works, and two thirds of these were by French artists, covering movements from impressionism and post- impressionism to neo-impressionism, fauvism, and the just emerging cubism (including works by Degas, Pissarro, Cezanne, Gauguin, Van Gogh, Matisse, Derain, van Dongen, Marquet, Rouault etc.). Neo- impressionism was presented in Russia for the first time (Cross, Signac, van Rysselberghe), along with the symbolists of the «Les Nabis» group including Vallotton, Sérusier, Maurice Denis, Roussel, Vuillard and Bonnard. They were very much respected by the early «Miruskusniki»- «Mir Iskusstva» (in Russian: «The World of Art») was a Russian magazine and an artistic movement (1898-1927). The exhibition had a huge impact. The catalogue was released in Moscow (1908), but that was not enough. 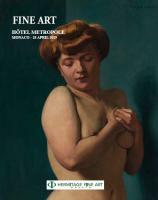 Paintings by the French artists, and photographs of the exhibition hall, 94 images in total, were printed in three issues of the «Golden Fleece» magazine (1908. No. 7-9). Thanks to this, today it is still possible to see how these artworks were first presented to their contemporary audience.